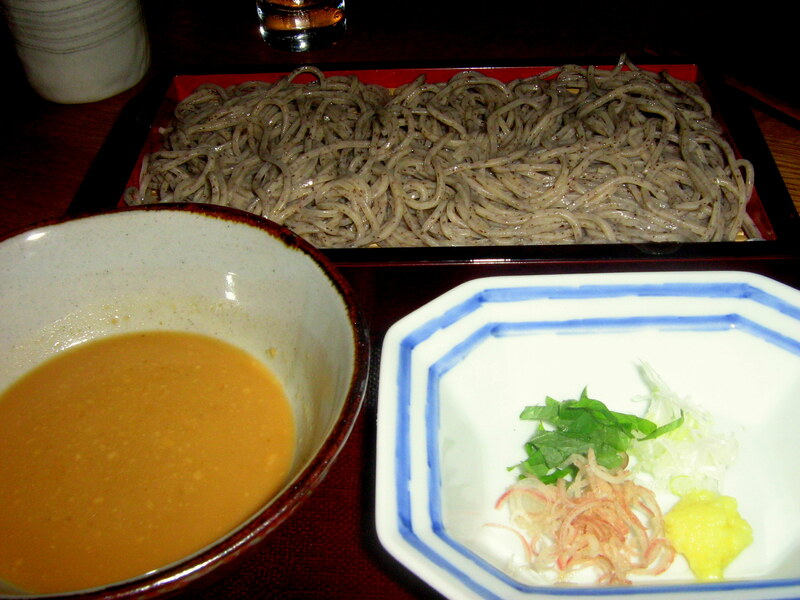 As long as I can remember, soba was the plainest noodle dish available. Cold grey strands of buckwheat noodles set on a bamboo tray, with nothing but a soy-based dipping sauce accompanying it. Simply put, one eats soba purely for the noodles and not the fanciful toppings or flavor-packed sauces that come with other noodle dishes. At Matsugen, the newly opened Japanese restaurant anointed with Jean Georges Vongerichten star power, you can choose to slurp your choice of three sobas plain. However, you do not need to be a purist at Matsugen, where its house specialty comes topped with a myriad of toppings. After all, this is the U.S, where choice is king, and this is a JGV establishment, where liberties are allowed. The noodles ranging from smooth to coarse were handmade and had good al dente bite to them. and an intrinsic nutty taste heightened by the sesame based dipping sauce. The guys enjoyed their Matsugen soba, also known as the “everything but the kitchen sink” noodle, with scallion, bonito, yam, okra, wasabi, egg and other ingredients thrown into the mix. With a menu that tries to cover so much ground, it would be remiss if we didn’t try the other dishes. We decided to forego the sashimi and sushi, which to our knowledge was pricey and average, and instead picked a few interesting dishes. 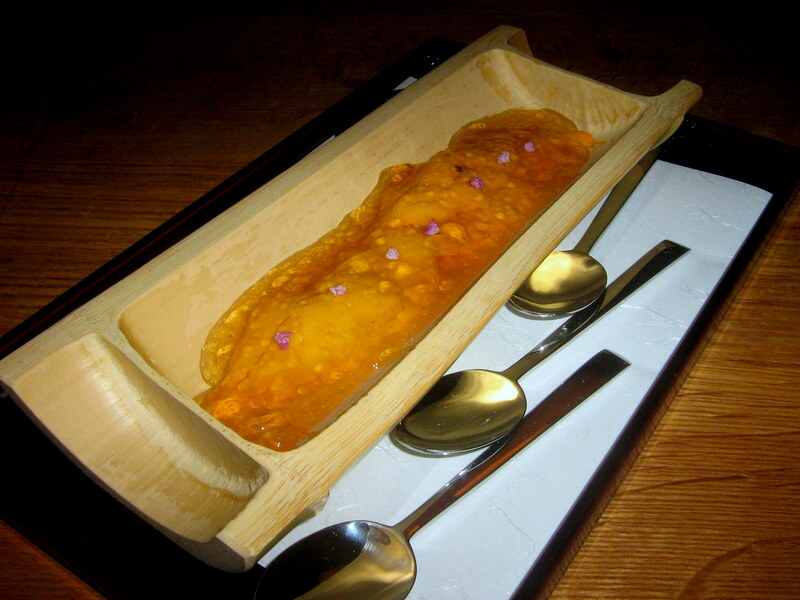 The uni with yuzu jelly was fantastic, with the jelly and uni simulataneously sliding to the back of one’s throat, while providing contrasting sweet and sour flavors. The Bakudan too had uni, along with other slimy components such as raw squid, natto and a poached egg, with each different flavor layered on top of each other, the funkiness of natto staying safely in the background while fresh wasabi gives it a bracing finish. Between our final two and most expensive savory dishes, I would count the kurobuta pork shabu shabu the more successful one. The tray of thinly sliced pork, after being lightly swished into a boiling pot of water and vegetables and then dipped into ponzu sauce was clean tasty yet very meaty, a taste akin to liver. The Uni Kamameshi (yes someone on the table really likes uni) was slightly disappointing, as the big pot of sea urchin cooked fluffy white rice smelled transcendent but tasted flat. It is indeed a waste to cook uni. We ended the night with desserts, ranging from Jean George’s famous molten chocolate cake (with green tea icecream providing the Japanese touch), a parfait with mochi, grapefruit jelly that looked ingeniously like slices of real fruit (the jelly is solidified within an empty grapefruit skin) and a bruleed ice-cream that unfortunately tasted far too ordinary to be so enthusiastically recommended by our server. With all the hype surrounding the restaurant, I must admit I was pleasantly surprised by my experience. Could the room be less stark and plain, and more decorative fixings added to the series of fish filled tanks to brighten the aesthetics? Sure. And could the expensive and sometimes random menu be more tightly curated? Definitely. But this is seriously good soba, and this is as good a place as any for a bowl of quiet luxury.